Christiane Yeardsley, of Narrawin Stud in Australia, has an interesting and diverse collection of saddles. The one pictured, for example, is a Maremma saddle from Italy. It is treeless - instead the leather is heavily stuffed with padding. The quilted floral pattern on the seat adds a decorative touch. Since Narrawin Stud specializes in easy-gaited horse breeds, from the Paso Fino to the Icelandic, Christiane has many saddles specifically designed for these horses. Christiane says, "My goal was always to acquire functional equipment, and everything I own, I use." "I acquired the first few interesting ones in about 2002. I've always had an interest in the horse breeds, riding cultures and equipment of other countries. I'm from a German background. When I first started riding in the Seventies, every self-respecting person there still had a Warmblood. The Icelandic horse and the lifestyle that it brought with it was just getting off to a roll. Equitana in Essen was just starting to feature exotic breeds, and I remember seeing Peruvian horses and gear; Spanish, Western and Camargue horses and saddlery for the first time. Ever since then, I was hooked. "We had Haflingers when in Germany, and soon I was experimenting with fancy costumes and bridles but didn't have enough pocket money for fancy saddles. But the acquisition of an old and only partially intact German army saddle led to hours of fun in returning it [to useable condition]. I was also lucky to have friends who had lived in Afghanistan for several years and had brought back with them a selection of saddlery. I spent hours looking at their gear and used every opportunity to borrow and try things out. "After coming to Australia in 1982, I spent several years just competing in various disciplines. I found Australia to be a land of horses, but no breadth of horse culture. Knowledge of 'other ways' of riding, horse breeds and gear was, and still is, very limited. 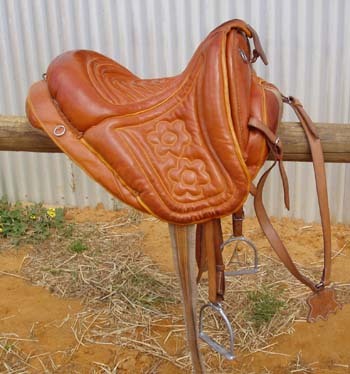 I was thrilled to discover the Australian stock saddle when I came, and I still regard this type of saddle highly, using it daily when I start young horses. However, when I started working with gaited horse breeds (American Saddlebreds, Pasos and later on Icelandic Horses), I really became interested in alternative methods and equipment again." I asked Christiane what's still missing from her collection. She said, "I'm particularly fond of Spanish/Portuguese saddlery, but love the variety of the South American gear that can be found. I would like to add a Camargue saddle to my collection. And then there is Asia! [...] I'm fascinated by the saddles of Japan and the stirrup design. My books about Samurai show several such, but frustratingly, never in enough detail to determine the rigging and other attachments. So much more to learn!" Take a look at Christiane's website to see dozens of saddles with informative descriptions, and additional pages featuring stirrups, bits, and other accessories. Photos from www.narrawin.com, used with permission. Thanks, Christiane! Artist Linda Windell's paintings caught my eye years ago because of her attention to detail in the adornment of horses, particularly Native American horses. I loved the texture, detail, emotion and energy in her paintings. She also paints commissioned portraits of horses and other subjects, and has won awards for her work. GHC: I suppose my first question is, being self-taught, when did you begin drawing and painting? LW: I've drawn and painted as long as I can remember. GHC: Was someone or something an influence in getting you interested in art? LW: The interest was always there. Art has been my passion since memory began. GHC: What were your first subjects? LW: Horses, then other animals and people. GHC: What got you interested in depicting horses? Did you have any personal experience with horses growing up? LW: I inherited my love of horses from my maternal grandfather, who raised them on a ranch in Beggs, Oklahoma, long before I was born. My cousin, Don, taught me to ride when I was three years old and I was hooked for life. GHC: What research or experience led to your detailed depictions of Native American horses, especially the details of tack, paint and other adornment? LW: I'm Native American by birth and perhaps there is such a thing as genetic memory... At any rate, I don't consciously choose my subject matter. The images come to me like a gift and I paint what I'm given. If the image includes adornment, research is necessary to make certain it's correct. GHC: I noticed your painting of the Barb horse, with beautiful attention to the details of the ornamental tack. 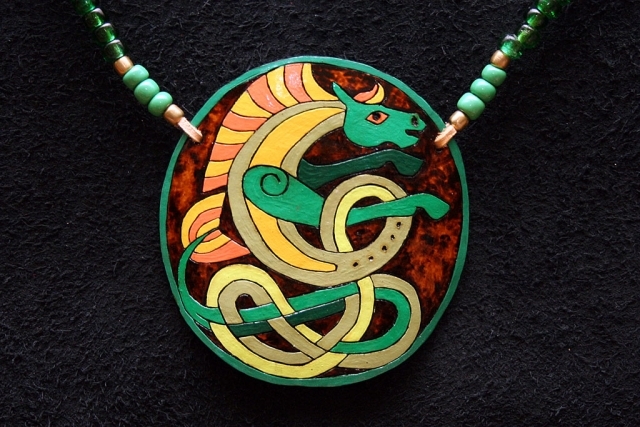 Have you been inspired by any other breeds of horse or types of historic/traditional ornament? LW: I'm inspired by all breeds of horses and became interested in different types of adornment while researching for the War Pony series. One thing led to another! GHC: What, if any, specific projects are you currently working on? 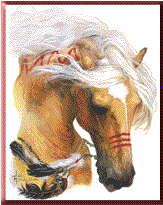 LW: I've begun the series of five sacred horses of the Navajo, who carry the sun from the east to the west. I'm in final stages of two different Arabian pieces, and I'm working on a series of what began as Native American Butterfly Women, but has grown to include other indigenous cultures of the world. Thanks to Linda Windell for taking the time to chat with me. Check out Linda's work at Morning Star Studios. Image: Wind Walker, War Pony IV, posted with permission. Professor Sergio Beck has as his mission discovering and preserving Brazil's rarest breeds of horse. Brazil is an enormous country with widely varied cultures and terrain. The coastal region is most populated, but the vast interior is home to many cattle ranches, and each region has developed its own breed over the centuries. These horses are well adapted to their specific environments - be it rugged mountains, arid grasslands, swampy plains or even tropical jungle. As with horses like the Marsh Tacky (see my previous post) in the United States, these rural working breeds have little commercial value as show horses, but are invaluable partners for ranch work and transportation. Beck teaches at the Pontifical Catholic University of Parana (PUC-PR), which has a large Equine Studies department. He was kind enough to discuss his work with me recently via email, and he had some interesting thoughts about the conservation of Brazil's rare breeds. Among the least known, he said, are the Pantaneiro (from the vast Pantanal swamp); the Campeiro, a breed traditionally used in the long-distance cattle drives in southern Brazil; the Lavradeiro, from the jungle state of Roraima, which was only recently identified (by Beck himself); and the Nordestina, which he describes as "a fabulous breed, but in danger of disappearing if nothing concrete is done for it." Beck said the Nordestina is a "valuable breed in terms of hardiness and function, well adapted to the Caatinga." Sadly, he said, the Nordestina "was formerly being managed by a breed association, but today, because it has so little commercial value, it has been left to its own devices." In Beck's opinion, there are probably many more undiscovered and unprotected regional breeds in Brazil, in danger of disappearing before they are even known. I will offer further reports on his work and on the specific breeds in future posts. A browse through the Adornment category on this blog will reveal all sorts of innovative horse decorations from around the world. 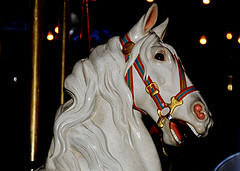 But a charming type of horse jewelry is used right here in the modern United States: Rhythm Beads. Popular with barrel racers (and girls of all ages), these beaded necklaces usually incorporate bells, and are suggested as a useful way to hear the rhythm of your horse's paces, to warn others of your approach, or to calm a horse with the gentle sound. Some people use them as good luck charms or amulets. Mainly, I suspect, they are all about making your horse look pretty! Inspiration comes from the traditional tack of the Arabian horse, the beaded, feathered and painted horses of Native America, and the charms and amulets traditionally used in many cultures to ward off danger (see this post). Simple, mass-produced rhythm beads can be found in many Western tack shops, but several artisans found online make unique and creative versions. Eileen at Lipizzan World makes rhythm beads featuring celtic designs. The pendants are carved from gourds, using a heated tool, and finished with paint, then attached to a necklace of gemstones and tiny bells. After initially creating one for her own Lipizzan mare she discovered a clientele among fellow horsewomen. Eileen designs the pendants, she says, based on the client's personality, incorporating her knowledge of Celtic and Native American mythology and spirituality into the final product. The image above, Each-Mara, is one of my favorites. A few other artisans make creative and interesting horse necklaces, or related horse ornaments: starlingblue on etsy makes strings of beads to clip into the mane and tail, featuring pretty combinations of glass beads; rhythm and rhyme makes complex beaded necklaces designed with the spiritual symbolism of gemstones in mind. Evans [said] he first heard about the phenomenon from a blacksmith in Devon. "I had always wanted to write a book about an ancient subject set in the contemporary word [sic] and this seemed perfect," he said. "My research took me to Scotland where I read academic papers from Stirling University about a secret Scottish sect called the Horseman’s Word. "It was such a fascinating subject, and I got more and more obsessed with it." The article goes on to discuss an interview with the last known living member of the Horseman's Word, Billy Rennie, who describes many things he was taught as a child and how he was initiated. Hempfling is a rather interesting trainer (based in Denmark) who practices a unique style of training, although it is not entirely different from Natural Horsemanship. In his videos of ground work you can see his extensive use of body language - far more than most trainers use - such that he appears to "dance" with the horse. He has an extensive collection of books and videos available, although I find the videos are not particularly methodical, in a way which might allow others to learn his methods simply. Rather they are intuitive, free-flowing, and beautiful, and thus quite a pleasure to watch. Here is one where you can really see how Hempfling uses his body to direct the horse while free-lunging. The New York Times has a fascinating obituary today for Marvin Sylvor, a world-renowned maker of carousels and carousel horses. Take a look here.